Let this structured six-panel brushed heavy cotton cap light your way. It features bright long lasting LED lighting in the peak of the cap to illuminate the area in front of you. There are two LED lights, one on each side of the centre. These can be switched on or off as you need them, making this cap great for day or nighttime wear. This is your basic cap with a bonus that is sure to come in handy. Since it is made of heavy duty cotton you can rest assure that it is durable and will last you over time. Comes in one adjustable size, so no worries about ordering different sizes. This cap comes in two solid colours: avy and black. This cap is great for anywhere during the daytime -- but it really shines in the night or in low light situations. It would be a very handy addition to the uniform of staff who might benefit from a little extra hands-free portable lighting. Security guards, mechanics and technicians would all find this lighting handy. Not only that, it would be great for clubs with night activities -- outdoor clubs, night fishing enthusiasts and others. 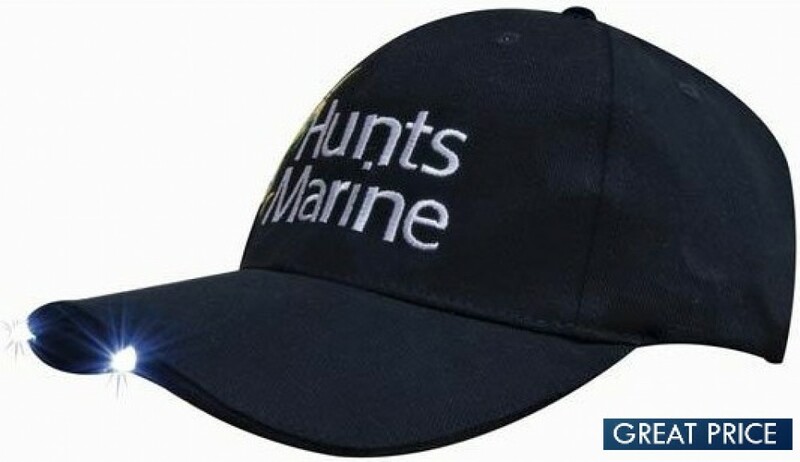 Order now to get your business or organisation's logo branded on these attractive and useful caps.